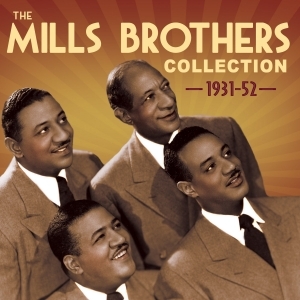 The Mills Brothers were one of the most important and influential vocal groups in 20th century popular music, bringing together styles and techniques that embraced barber shop, gospel, doowop, ragtime, jazz and more to build an extraordinary career that spanned over half a century and more than 2,000 recordings. Their unique ability not only to harmonise so expertly, but also to re-create the sound of wind instruments with their voices, enabled them to exploit the “Four Men And A Guitar” formula to generate a string of hits through the decades that spanned WWII. This great value 54-track 2-CD set, which does not duplicate any recordings included on our existing Fabulous releases (‘Sweet Harmony’ FABCD160 and ‘London Sessions’ 1934-39 FABCD252) is drawn from their wealth of repertoire from their early recordings in 1931 through to their final Top 10 hit in 1952, including recordings also featuring Louis Armstrong. It’s a very enjoyable collection which admirably showcases their unique talent. 6 By The Watermelon Vine (Lindy Lou) Mills Brothers with Benny Carter & His Orch. 25 Be My Life's Companion Mills Brothers with Sy Oliver & His Orch. 26 Glow Worm Mills Brothers with Hal McIntrye & His Orch.